Thank you so much to everyone who sent me birthday wishes this week – we actually celebrated over the weekend by going bowling, having a special dinner and watching a movie together as a family. I still can’t believe this will be my last year in my thirties, but I’m hoping it’s the best one yet (and my husband is already starting to make plans for my 40th extravaganza)! Today’s casual look is the first in a new series as part of a long-term partnership that I’m kicking off with Joseph A. You may have seen their line in your local Macy’s, Nordstrom Rack or Von Maur. But I have exciting news – they just launched their own website so you can now order direct! Prior to them reaching out to me, I already owned a couple of their sweaters that I’ve had for years. I love that they are high quality knits at an accessible price & I can’t wait to share some of my favorites with you over the next month. They’ve graciously offered an exclusive discount for PPF readers – if you sign up for their emails here, you’ll receive a special code for 35% off your purchase sitewide. 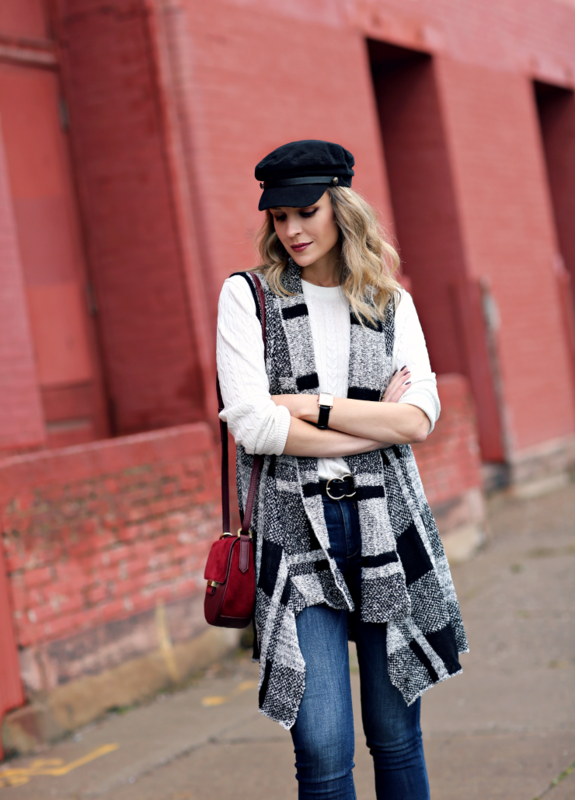 Vests are such great layering pieces for this time of year & I’ve always found them to be incredibly versatile – I love how lightweight this one is + the print is so perfect for fall! Another way I’d style this is with a gray turtleneck, faux leather leggings & over-the-knee boots. They also have some solid color vests in black & mocha that would be ideal for transitioning into the spring. See more of my favorite affordable vest options below in varying styles, colors & lengths! You are looking fantastic in this Parisienne like outfit! What a wonderful way to celebrate your birthday! Looking gorgeous as always, when your forties arrive next year you’ll be ready, lol! Actually I’m turning 50 in June and I can hardly believe it, seems like just yesterday I was having a hard time believing I was about to turn 40. Oh well, life is good and only gets better! Sounds like you had a fantastic birthday! I love that plaid vest! I’m crazy for plaid but this one looks so cozy! This outfit is pure perfection! I just love that vest on you, and you look so adorable in that hat! I need to branch out and try one! Happy belated birthday! Hope it’s your best year yet! My birthday was Tuesday and I also turned 39! I wrote all about my feelings on being an “older” fashion blogger in my post today! Looking gorgeous and rocking this hat! This is such a cute fall plaid vest! And sounds like a wonderful birthday! happy birthday and this outfit is adorable on you. the hat is perfect!! This plaid vest is so cute! Love it with the hat and booties. Sounds like a great birthday!! That fall plaid vest is so cute! I am loving this whole outfit!! 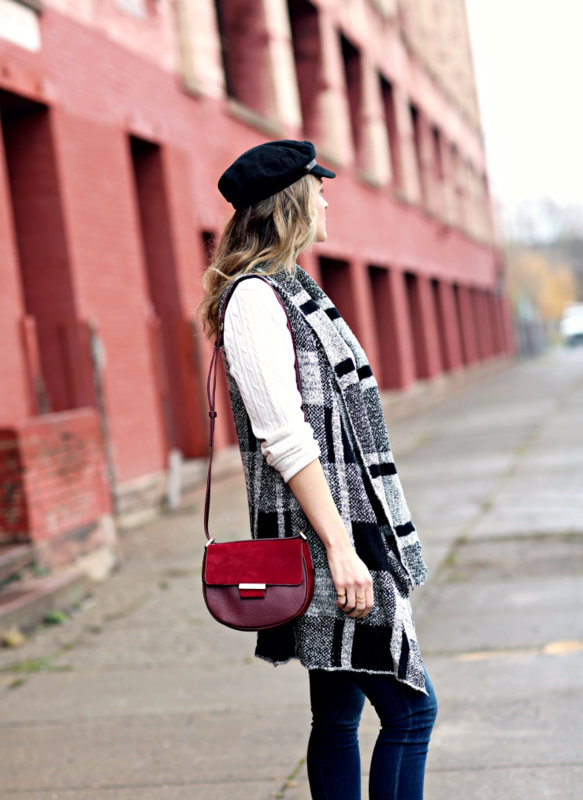 You are totally rockin the baker boy hat and that vest is perfect for Fall! I love this vest! It is so chic and cozy! Awww I’m glad you had such a good time celebrating your birthday with your family. I’m really loving the combo of this plaid vest and your cute hat. I love this casual cool outfit, you look great in that plaid vest! LOVE this vest and your boots are amazing!!! This vest is gorgeous! Such a chic look! You look amazing!! I love this look and that darling hat on you. That plaid vest is the cutest! And I love the pop of red! this vest is so cute! it would be so perfect for Thanksgiving! A pop of plaid is always a great idea. I love your booties too! Love the vest, very cute! LOVE this and love the pop of color!